For those feeding foxes we suggest the food is now supplemented with extra vitamins and minerals. This is very easy to do. Unsaturated Fats: Deficiency of unsaturated fat for example in the diet can result in the animal suffering dry hair plus hair loss and redness of the skin leading to skin lesions. Essential unsaturated fats can be ensured for either dog or fox by the addition of a teaspoonful of a good vegetable oil on a daily basis. Sunflower seed is said to be the best. Foxes also seem to love Sardines in oil and these will certainly help the skin and hair. Vitamin B12 should be included in the diet at least twice a week and fresh liver provides a good source of this. The two vitamins that seemed to crop up within our research was Vitamin A & D. To counteract an A & D deficiency a product obtainable from most pet shops called ‘Stress powder’ can be sprinkled onto the food each day providing both A & D vitamins along with calcium and phosphorus. Vitamin Powders can be obtained from pet shops just ask for a good all round vitamin and mineral supplement. Alternatively putting out Marmite sandwiches will prove to be a great source of essential vitamins. The National Fox Welfare Society continues to lead the way forward in eliminating Sarcoptic Mange in foxes across the country. In an average week NFWS can send out over 200 bottles of treatment for mange free of charge to householders feeding the foxes in their garden that are suffering from this terrible condition..
Mange is a terrible condition that untreated will see the death of the infected fox. We believe that if a condition can be treated then it should be, regardless of whether the householder is unwilling, or unable to pay for the treatment. One can only imagine how unpleasant this condition must be for the fox. In bad cases a fox can have over a million mites under the skin causing severe irritation. Your donation, however small, can and will make all the difference. We ask once more, you scratch our backs and we will take the itch out of theirs. 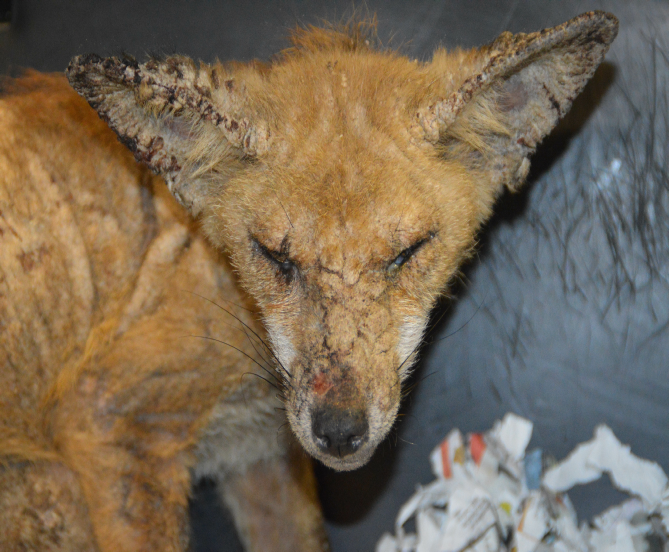 Visit our foxy mange website for Free mange treatment and to see where the mange is occurring in the UK, some photographs of foxes suffering from varying degrees of mange, peoples letters who have successfully treated foxes with mange. We also have a FAQ for mange plus lots of information to help foxes suffering from mange.